After a long and arduous week, the Ski Salt Lake Shootout came to a close last Friday, followed by a classy awards ceremony at Keys on Main. 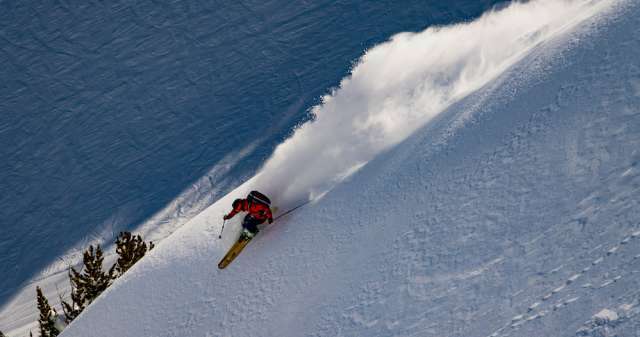 The Shootout is a weeklong photo contest with 7 professional photographers and 21 athletes working to get epic photos at each of Salt Lake’s 4 resorts. As a participating athlete, I teamed up with photographer Steve Lloyd, Snowboarder Jake Lawlor, and fellow skier Kevin Brower to shoot at Snowbird, Solitude, Alta, and Brighton. With a stacked field of competitors and 16” of fresh snow, we knew we had to work hard and use our creative senses to produce winning shots. Luckily our photographer, Steve Lloyd, has been taking ski photos in the Wasatch for years and had already scoped out spots to shoot. A good ski photo is totally dependent on good conditions though, so we spent a lot of time exploring acres of in-bound terrain at Salt Lake’s resorts. When all the snow inside the resorts was skied out, we utilized the awesome backcountry access offered at each resort to pursue fresh powder and epic cliffs. I’ve been skiing Salt Lake’s Wasatch Mountains for many years, and I feel like I just barely realized how much terrain is available in our 4 resorts. Each one has different types of rocks, trees, and lighting, so each day of shooting naturally produced a variety of shots. To fully capture the unique aspects of our mountains, we ended up spending at least 14 hours a day on the snow working. So next time you see a stunning ski image in a magazine, remember the amount of work it takes to get the location in the right light, with the right snow conditions, and an athlete in perfect form to make that picture. This contest forced my team and me to work harder than we’ve ever worked before. Although we’re tired and sore, we’re thrilled about our pictures and winning third place for best portfolio! There is still time to vote for your favorite photo in the best in show category on facebook. Plus, everyone who votes is entered to win a 3-day/3-night ski vacation in Salt Lake (lodging and lift tickets included). View the entire 2011 Ski Salt Lake Slideshow here.